I really do enjoy attending networking events. It gives me a chance to get out and mingle, hand out some business cards, and make real connections with business owners. I’m definitely all about meeting progressive people who are truly about their business and are ready to meet others who are walking along the same path. 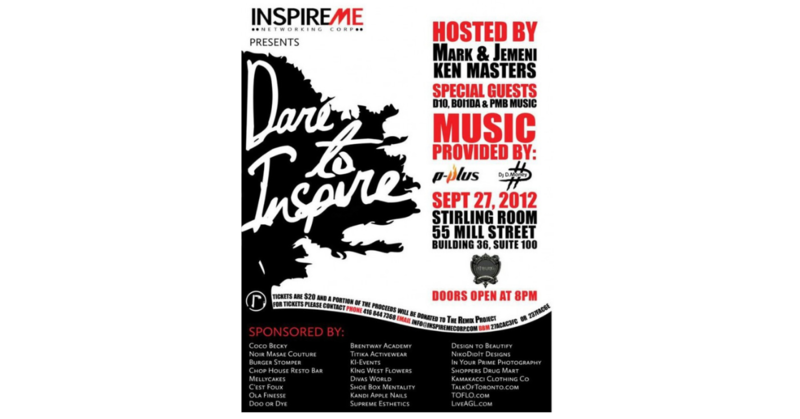 Last Thursday night, I attended the Dare To Inspire official launch party; a networking event thrown by InspireMe Networking Corp. The objective of Dare To Inspire is: “To create signature opportunities for new business owners and local talent to market their business and craft, share ideas and network with fellow entrepreneurs in a positive direction by helping them build secure foundations.” Who wouldn’t want to be a part of that? There was a mix of everyone at The Stirling Room who came to network and support the event. Hosts Jemini & Mark Strong with designer Atia Chambers (middle). The evening, that was hosted by G98.7 FM’s Jemini and Mark Strong, also included a fashion showcase which featured a few Toronto based designers. The only designer set that really caught my eye and that I can incorporate into my style was Atia Chambers’ line C’est Foux. It was fabulously accessorized by a long rope and chain link earrings and consisted of flagrant prints, unapologetic funk appeal, and a pair of multicoloured ink-blotched wide-legged trousers that I need to get my hands on – pronto. Anyone that wears an incredible leopard printed skirt like that, has my vote in anything they do. I look forward to seeing more from this talented designer. I’m sure she will soon enough become a force to reckon with. There were a few sponsor booths sprinkled throughout the venue – Ola Finesse and her stunning jewelry line (I just had to purchase a silver funkified bracelet), a brightly lit candle-accented colour burst of floral expression from King West Flowers, and Ki-Events had her table chock-full of information about her services. Renowned custom cake creator Mellycakes even had one of her tiered creations on display to celebrate one of the organizer’s birthday. At the beginning of the soiree, it was perfect. I met a handful of people with whom I was able to speak with and they have now become future business prospects for me. The lighting was dimmed just right, so you could read each other’s business cards. The music was at a level where conversations could be had and the hors d’oeuvres were lip-smacking good. Personally, about a couple of hours in is where the shift occurred and my experience began to alter. After a while, I realized I was in competition with the blaring music and wasn’t able to actually converse with anyone. Then I wasn’t able to really see that well, because the lighting had been dimmed way too much. Also, from what I was told, proceeds of the event were to be donated to The Remix Project, who allocates funds and resources to youth in the community with interest in entrepreneurship. I really cannot put my finger on how many times that was mentioned throughout the night, because I don’t remember hearing it in excess. A time before the fashion showcase even began, I found the vibe shifted immensely. It stripped away from the networking aspect of the evening and got lost in a party atmosphere way too quick. Don’t get me wrong, networking events are supposed to have an upbeat facet to it, otherwise, it would be sheer and utter boredom for patrons. Everything has to be – right. For me, that is usually encompassed by the surge of energy that comes about from the patrons and the right music. I’ve been to my share of networking events here and in NYC. Enough to know that atmosphere is everything, your music sets your tone and the people you invite – those who are ready to get down to business and know how to walk the fine line between business and a touch of pleasure – are ready to really network. All of that to me is the essence of a networking event. I would have rather that it was either a networking event or a party to celebrate the company launch. Either/or rather than both in one setting. But again, that’s just my opinion and my overview of the night. All in all, I say kudos to the lovely ladies who put this event together for a great cause. The Remix Project will definitely reap the benefits from the work InsipreMe Networking Corp will bring to its program. The affair looked like it was a hit and I do wish them great success in their future endeavours.